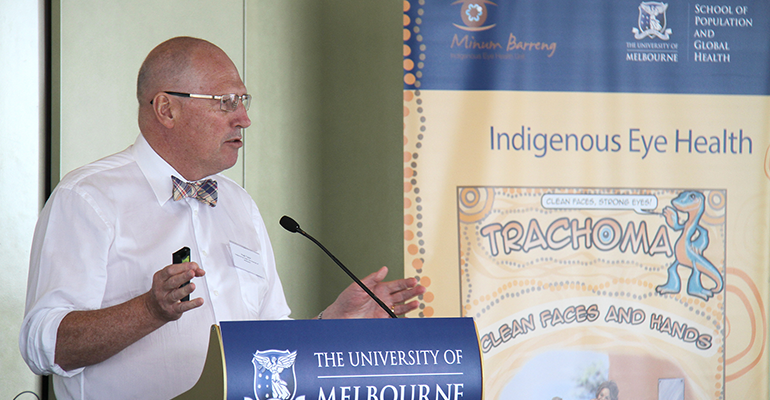 Professor Hugh Taylor AC is the founder of Indigenous Eye Health at Melbourne University, and is fighting to close the gap of preventable blindness among Aboriginal and Torres Strait Islanders by 2020. He is this week’s Changemaker. The feeling of restoring someone’s sight is what Taylor describes as “almost biblical”. The surgery for restoring sight is often quite simple, but the impact of the surgery, and the emotional response that comes with it, often leaves Taylor at a loss for words. While 94 per cent of vision loss is avoidable, Aboriginal and Torres Strait Islander adults are six times more likely to suffer from blindness than non Aboriginal and Torres Strait Islander adults. 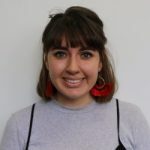 After working in remote Indigenous communities with the Fred Hollows Foundation, as well as overseas, and seeing little change in the statistics over a number of years, Taylor decided it was time to take serious action on closing the vision gap. 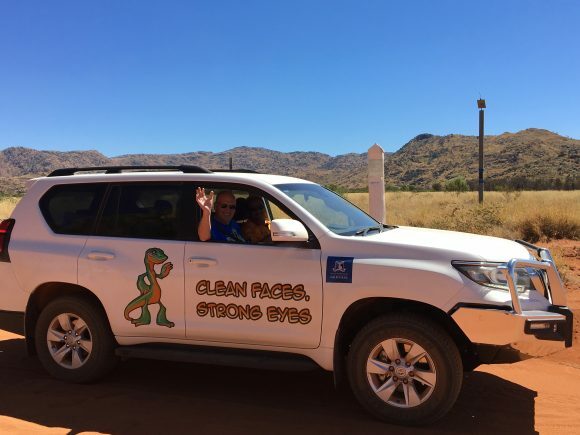 Taylor is on a mission to close the gap by 2020, through sustainable health systems that will change the landscape of Indigenous eye health, forever. In this week’s Changemaker, Taylor discusses why he was inspired take charge of Indigenous eye health, creating sustainable solutions, and the feeling of restoring a human’s eyesight. 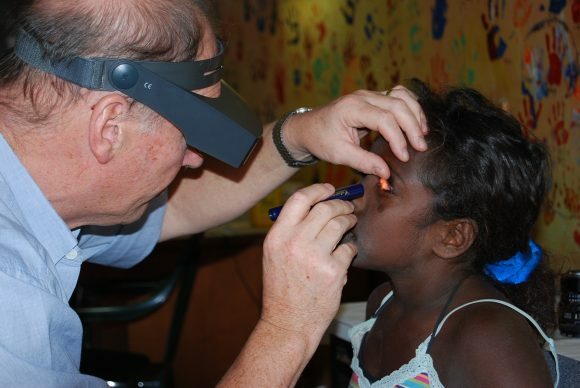 What made you want to specialise in Indigenous eye health? Back in the 70s, when I was doing my ophthalmology training, I spent a year working with the Fred Hollows Foundation. Over a period of a year or so, we examined Aboriginal and Torres Strait Islander people across the whole country, and this gave me a real insight into some of the conditions and disadvantages of Indigenous people across the country. It was when I did a review for the Commonwealth, in the mid 90s on Indigenous eye health, and made a series of recommendations, that I realised in 30 years, nothing had changed. I realised no one else seemed to be doing much to make a change, so I rolled up my sleeves and got on with it, moved to Melbourne University and set up the eye health unit, to really try and focus on this problem full time. When you were working in those remote communities, at what point did you realise it was a really big problem? I’d been brought up in middle class family, and went to school and university in Melbourne, living quite a privileged life. Keep in mind, I was there over 40 years ago, so things have changed, but when I was working in these remote communities, many were wearing old second hand clothes, lacking facilities to wash themselves or their clothes, with eye, nose, ear and skin infections. It was very different from walking around suburban Melbourne or working in the emergency room or outpatient clinic. That fellow Australians were allowed to live like that was just not right and a real shock. I just couldn’t understand how that could happen in Australia. It was when I went overseas and did work in Africa, Asia, America and the Middle East, and saw what can happen and change there, that I realised things hadn’t changed in Australia and we needed to do something about it. Why did you think setting up your own clinic and area of work was more effective than the work you were doing with Fred Hollows? The stuff I did with Hollows was really a survey, and one-off eye care, and an attempt to set up ongoing eye care. I was then one of the founding board members of the foundation, they weren’t really doing much in the Indigenous eye health space, mainly focusing their work overseas. I was also running a big clinical department and research group, and the Centre for Eye Research Australia, amongst other things, and it only left an hour or two a week to think about Indigenous eye health. I really wanted to develop long term and sustainable changes, rather than having one-off services, that needed time and effort to identify the problems, and then working out what the solutions are, and how they could be best rolled out. Restoring someone’s eyesight is a pretty significant act, what does that feel like for you doing the work? Ophthalmology is almost biblical. You’re making blind people see again, and that can be both rewarding for the patient and the family, but also for the practitioners. Sometimes it’s quite embarrassing, because all you’ve done to people, once you’re trained, is a simple operation. But taking out someone’s cataract, particularly if it’s a very advanced cataract, to take that out and do it properly, you feel very satisfied at the end of surgery. The next day when you take off the bandage and the dressing, and the patient is bursting with emotion, and joy at being able to see, count how many toes they have or touching their nose. Sometimes they are so excited, you really don’t know what to say, and that’s really very moving and very exciting. Are there other reasons aside from a lack of services that contribute to the high numbers of vision loss for Indigenous people? Well it’s interesting, because when we first set up the Indigenous eye health unit, we did a survey and found that the unmet need in the inner-city Melbourne suburb of Fitzroy, is the same as it is, in Fitzroy Crossing, up in the Kimberley. In the Kimberley, we obviously need to get more eye services out there, but the Victorian Aboriginal health service in Fitzroy is less than a mile from the Royal Victorian Eye and Ear Hospital, the largest eye hospital in the Southern Hemisphere. They were also having seven times less surgery to remove cataracts, and they were four times more likely to wait for more than a year to get surgery done. Some of the reasons for not using services were for simple things like cultural safety, or institutional racism that was keeping people away. Other things were the movement of more and more surgery into private hospitals, with big gap fees. We ended up saying that the path of care was like a leaky pipe, there are lots of cracks where people can fall out of the system, and if you only fix one or two cracks, the pipe is still leaking. You actually have to address each of those issues, to fix the pipe. Do you feel you’ve received enough support from government? We’ve had a lot of support from government, and there has been a lot of things done. Of our road map, there were 42 recommendations, and more than 16 of those have been fully implemented, and we have a first step done on every one of those, and about two-thirds or more of the intermediate steps have been done. So we are actually making really good progress. The government has put in a whole lot of funding into quite a number of those recommendations, and made a number of those changes. There’s still more work to do, and we’ve made good progress, rolling out this improved way of delivering eye care, we have halved the gap for blindness, but more needs to be done to implement those recommendations across the country. We are hopeful this will happen in the next funding cycle, people see what progress is being made, and we live in hope that we will close the gap for vision in 2020. Do you think vision loss receives less attention because it doesn’t immediately cause death? Something we outlined in our report on closing the gap, is the false reasons for not doing something about blindness. People say it doesn’t kill you, but actually, if you have visual impairment you have more than a two fold increased risk of dying. Vision loss caused 11 per cent of the health gap. The first is heart disease, the second is diabetes, equal third is trauma and vision loss. It’s actually very important. The second is people say you can’t do anything about it, and it’s just a natural part of ageing, but in fact, 94 per cent of the vision impairment is unnecessary, and it’s treatable. Much of it can be fixed overnight. You can give someone a pair of glasses, they see right away, and if you do cataract surgery, they will see the next day. So unlike some of these other chronic problems, like alcoholism, or heart disease, or kidney failure, with vision loss, most of it we can actually fix. What we see, is the eye care is providing a paradigm or a template on how to link primary care with the specialist services, because if we can sort it out for eyes, it can work for hearts, and lungs and kidneys. Why exactly is it that blindness is linked to shorter life expectancy? People who have vision impairment, have a doubling risk of falls, an eight fold increase of hip fractures, are three times more likely to have depression, and you can’t actually get around to look after yourself, or go to the doctor or participate in community and religious events. And in addition, if you’re so blind from diabetes, you can’t check your blood sugar, you can’t check all your pills, or your feet to make sure they aren’t having problems. There are some very serious impediments that happen because of sight loss. It also prevents healthy and independent ageing. I mean, Makinti Napanangka, who won the 2008 Telstra Art award, had to stop painting because she was blind from cataract, and after she had surgery, she took out the award, and that’s fantastic. From not being able to take yourself to the doctor, or make a cup of tea, she was able to return to her career after surgery, so it’s really important. Our focus at the moment is working with advocacy and government to try and get additional funding, particularly the increase in funding for the visiting outreach services for ophthalmology and optometry, and funding for case management of patients who need care referrals in their treatment. We are doing a lot of work making sure that everyone with diabetes gets the regular treatment and that’s also across the country. In the area of trachoma, while we’ve had very good progress, there is still much more work to be done to eliminate it as a blinding disease. For that we are focusing on health promotion so that every child and family knows to keep the kids faces clean, to stop the transmission of infection, and also to make sure there’s washing facilities in the houses and schools, so the kids can actually make sure that they can wash their faces. Do you think it’s possible to close the vision gap by 2020? Yes! There’s a lot of work to do, but you’ve gotta back things that work, and we are actually making real progress. We’ve already halved the gap for blindness, reduced the rates of trachoma in kids from remote communities from 21 per cent in 2008 to 3.8 per cent, so I think we are making some really good progress, we just need to have the support to finish the job. What are you doing to ensure that the organisation that is set up is sustainable and continue on? My little group may disappear, and that’ll be fine, what we are really trying to do is develop long term sustainable changes so that this system just keeps on running. Once it’s set up in place, they’ll be checks and balances with monitoring and reporting, and the evaluation of reporting. So it’s really about building those sustainable solutions, building things into medicare, changing government policy, so services are properly funded and coordinated. I started 40 years ago, dropping into communities and fixing eyesight and then leaving, and that’s not what we should be doing in 2018, we need to be more sustainable. The national Close the Gap campaign extends beyond just eye health, does the complexity of the issue overwhelm you? It is complex, and I recognise that but no I don’t feel overwhelmed. I actually feel empowered by recognising it’s complexity. Stepping back and taking this health system approach, looking at the patient journey or the pathway of care, coming up with the notion of it being a leaky pipe with many issues to fix is important. There’s no silver bullet, it’s not the three key priorities. I’m quite empowered by a quote from Helen Keller, who said I am only one, and I can’t do everything, but I am one, and I can do something, and because I can’t do everything, doesn’t mean that I won’t do the something that I can do. With eye care, you can actually do it, and teasing out the real things that need to be done and as I said, most of it can be fixed, and most of it can be fixed overnight. I think we are making really good progress, and learning the lessons that we’ve been working out for eye care to apply for the provisions of other specialist health services. I guess it makes me optimistic that we can change, and recognising that there’s not a silver bullet, there’s not just three things that need to be done, you need to take a health systems approach, and look at the multiple things. And so taking a complex problem and unpacking it has been very important, and I think that has given me the optimism for when people ask if we can get it all done by 2020, because of course we can! If we can keep pushing on and kicking a few goals, it’s very doable, we will get there.